Diet Pepsi is in trouble. Less than a year after its poorly-received recipe revamp, it looks like PepsiCo is ready to try something new to turn things around. told the Wall Street Journal. With reported plans to talk with bottlers about the plan on Thursday, changes to the diet beverage brand could be announced as early as this week. The changes are urgently necessary, as Diet Pepsi’s sales have been continuously plummeting. In 2015, Diet Pepsi consumption dropped 5.8% by volume, according to report from Beverage Digest. 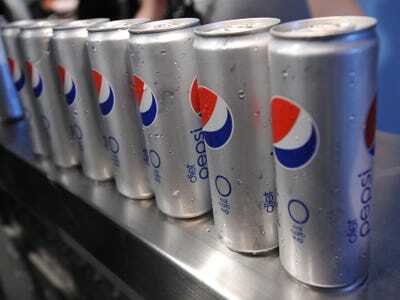 In August, PepsiCo debuted an aspartame-free Diet Pepsi, in response to consumers’ complaints about the sweetener. The negative backlash was immediate, and, instead of stopping falling sales, Diet Pepsi’s performance only declined after the new recipe’s debut. The negativity didn’t subside as the new Diet Pepsi became the norm. According to the Wall Street Journal, negative tweets about Diet Pepsi outnumbered positive ones by a two-to-one ratio between October and May, according to data from social media tracker Sysomos. Pepsi declined to comment on the topic, so it’s unclear if the reported “action plan” would involve returning aspartame to the beverage, another recipe revamp, or something completely different. However, simply returning to the previous iteration of Diet Pepsi seems unlikely to boost the beverage’s sales, as diet cola consumption have declined in the US every year for the last five years, according to Beverage Digest data. Diet sodas once seemed like the future of soda giants, eager to serve consumers who are increasingly interested in health and wellness. However, concerns regarding artificial sweeteners have trumped the desire to cut calories for many consumers. As a result, Pepsi and Coke are currently looking outside of the soda industry to attract health-savvy customers and grow sales. Less than 25% of PepsiCo’s global sales are from soda, with CEO Indra Nooyi saying the company is “future proofing” Pepsi’s portfolio by investing in new products related to health and wellness. Coca-Cola is doing the same, with multi-million dollar acquisitions such as soy beverage brand AdeS and Nigerian juice maker Chi Ltd.
PepsiCo needs to turn around the Diet Pepsi business, but, for now, it looks like the company’s best option for reaching dieting customers is through snacks and non-carbonated beverages, not diet cola. With a new action plan, the company is likely looking not for growth, but to simply stop Diet Pepsi’s continuing decline.